Regan Gillam combines several of her passions through her work at Abra-Kid-Abra, a company that performs and teaches kids magic. She said she loves magic and improv. Gillam is a junior scriptwriting major at Webster. 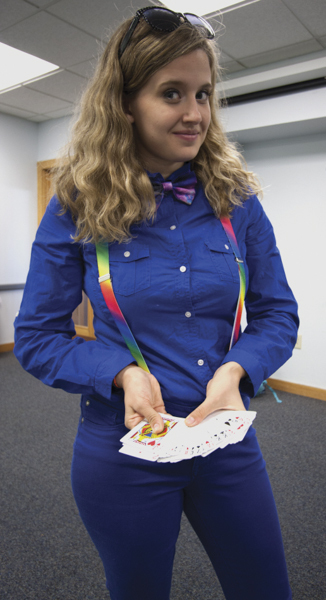 Performing magic can be a hobby or a career, but for Webster University student Regan Gillam, it’s a lifestyle. Gillam’s love for card tricks and for rabbits popping out of hats started when she was a child. She was inspired by her frequent visits to Disney World growing up. Gillam said she spent a lot of her mother’s money in a store at Disney World that she considered amazing. As she got older, Gillam decided to put magic on hold. She is a junior majoring in scriptwriting at Webster, but she also loves to act. She got back into magic when she was hired as an improvisation performer at Abra-Kid-Abra, a company that performs and teaches kids magic. While working at Abra-Kid-Abra, a co-worker who was fascinated with Gillam’s performance took noticed of her. The co-worker then offered Gillam an opportunity to work as a magic teacher., which Gillam accepted. She has worked at Abra-Kid-Abra for three years and performed there for one. “It was good because my mom felt that all her money and time she spent on my magic as a child is coming to use now,” Gillam said. President of Abra-Kid-Abra Jeff Lefton said Gillam is a terrific magician and balloon artist. He said she has great stage presence and knows how to create a connection with the audience when she performs. Lefton has only worked with Gillam for three months, but said he sees her creativity and warmth throughout each show. The experience of being a magician and balloon artist are rewarding in many ways, Gillam said. She was able to appear on the hit TV show “Let’s Ask America” where she performed magic tricks for the viewers. The show airs daily for a half-hour. Gillam said she loves to perform tricks in front of the kids. And with her rabbit puppet companion, Buford, by her side she said her shows are even more entertaining. “To see their (the kids) faces when they can’t figure it out, it’s pretty amazing,” she said. Though making kids happy through magic is a big part of her life, Gillam enjoys writing music in her spare time. She is also the co-executive producer for Surfacing Theatre at Webster University, which is a theater group for non-acting majors. Gillam said she gets her inspiration from comedians like Tina Fey and Amy Poehler. She said the two are not afraid to be themselves and they refuse to be stereotypical women. Gillam said when she’s acting, many people see her as a character, someone else. But she said magic is the complete opposite. She said when she is able to do magic she is able to be herself. Gillam’s long-term goals include writing scripts, acting and working for a television network. However, she said magic will always be a part of her.